There’s an app for pretty much everything, but when it comes getting input from the physical environment, smartphones are fairly limited. Mark, Ben, Mark, and Brian, a group of sensor enthusiasts from Sensorcon, noticed this, and developed a device to fix the smartphone sensor deficiency problem, dubbed Sensordrone. 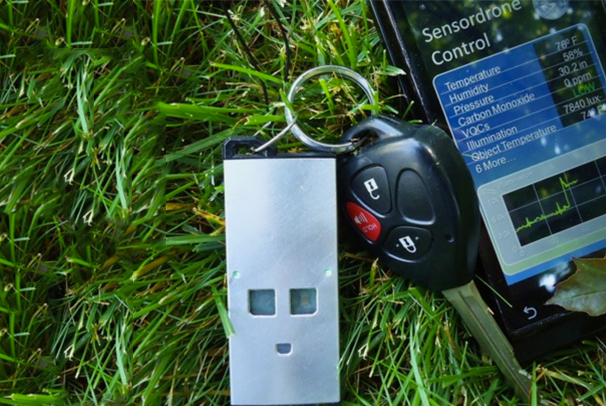 Sensordrone is a keychain sized accessory for your smartphone that sends information about the physical environment to your phone. They jammed as many sensors as they could into the smallest profile possible, and then added Bluetooth to connect it to their phones. Its components range from several sensors for detecting harmful gases, to a non-contact thermometer that can measure temperature without touching the object. All of the sensors can collect data in real time for you to use in whatever way you want. Confused? Sensodrone's makers built some sample apps to give you an idea of what it can do. For example, one app uses Sensodrone to measure your blood alcohol content; another can monitor the air quality and alert you if the air is unhealthy. The Sensordrone team also plans to make the software open source so that anybody can modify the sample code or build their own apps. The Sensordrone is normally $175, which may seem like a bit much to spend just to tinker with a bunch of sensors, but you probably won’t be able to find as nice a suite of sensors in such a neat little package anywhere else. Sensordrone is only in Kickstarter phase right now, but it’s already successfully met it’s goal. Make sure you check out the Kickstarter page for a full list of the Sensordrone’s features and capabilities, or if you want to pick one up yourself.